Writer’s Chronicle (AWP) – we often have extras of this magazine. If you want a copy, just shoot me an email at hfoster@sju.edu and I will check for you. Part-time teaching opportunities are available during the Fall 2017 and Spring 2018 semesters at The University of the Arts. The First-Year Writing Program at the University of the Arts offers foundational courses designed to help undergraduate students in creative fields develop important writing, reading, and critical thinking skills. These courses also introduce students to research fundamentals and the art of effective argumentation. To learn more about specific classes, view current course offerings here. Applicants must have at least a Master’s degree and recent experience teaching composition courses. Experience developing developmental composition curriculum or working in writing program administration a plus. 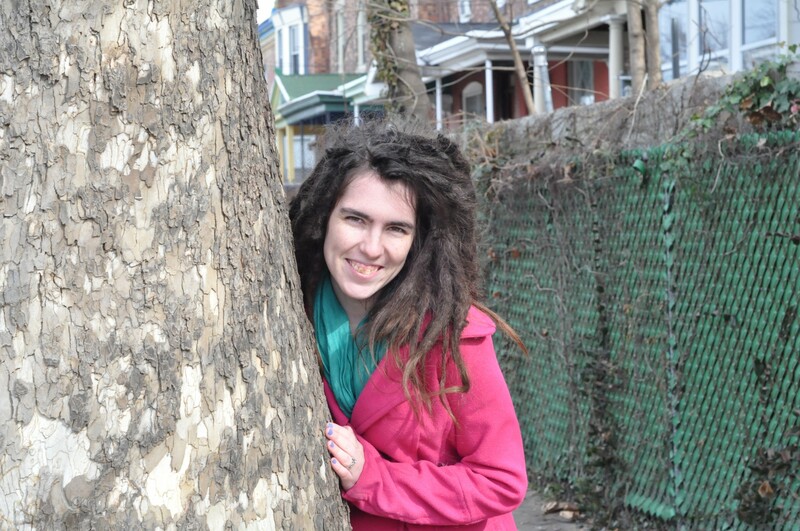 If interested, please forward digital copies of your CV, most recent writing course evaluation(s), and a sample assignment prompt you developed for a composition class to Dr. Emily Mattingly (emattingly@uarts.edu). Do you have any parting words or shout-outs to share with current students and faculty? Which Writing Studies course or course reading was most interesting or useful to you? Why? Gosh, this is a tough one because I truly feel that every course I took has benefited and matured me in one way or another. I guess if I had to choose, I’d say I’m pretty darn thankful for Maureen Saraco’s Grant Writing course because without that I would not have gained the experience necessary for my internship last year and (fingers-crossed) a career in development. But, of course I have to say that both April’s and Ellie’s poetry courses have proved useful to me. I often tell people that I got a degree in Writing Studies with an unofficial minor in poetry and I say that because I do feel that I received an MA and MFA experience all rolled into one. I know my poetry would not be nearly as strong as it is without the guidance of those two remarkable women. How do you plan to use your Master’s Degree in your career? Currently, I’m primarily applying for editing, development, and communication jobs; all of which I would not have felt confident doing before this program. My dream is still to eventually get my PhD (before 40) and teach at the University level– and in that way the program is a great stepping stone for me. Do you have any tips for future students about choosing classes, juggling the workload, or writing a thesis? Pick the courses that excite you the most– have fun with it. Understand that your professors are also juggling a very large workload and a certain amount of grace should be extended to them as you take their courses. Try not to skimp on the readings; they were chosen for a reason by some very wise people. Krisann just graduated from the program in May of 2017. 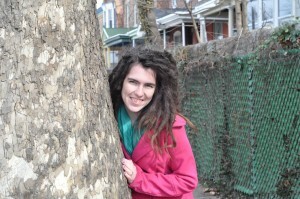 Currently, she is working on getting her thesis published, a collection of poems that explore the interconnections between home and homelessness. 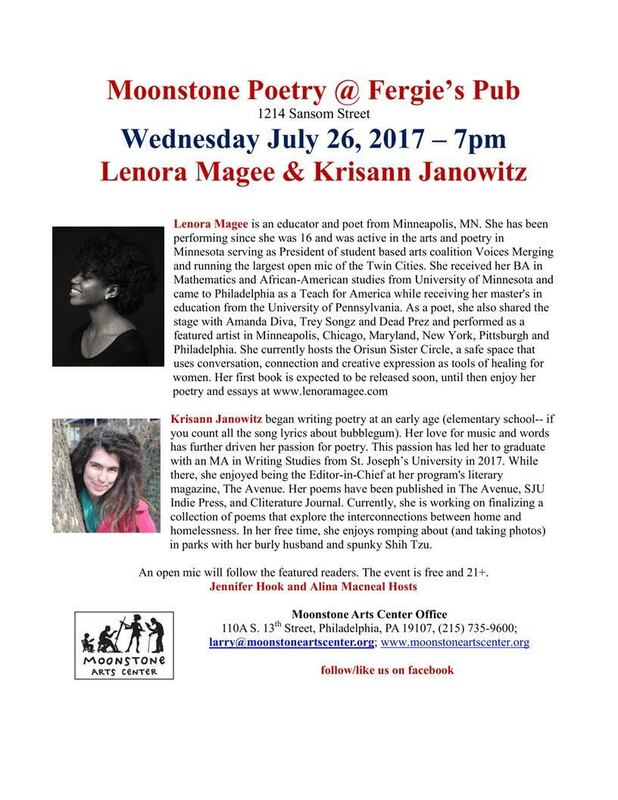 You can also see her perform her poetry at Fergie’s Pub on July 26th at 7 pm. This course will offer an introduction to the multi-faceted profession of editing, focusing primarily on editing for print publications but also including video editing and tools/platforms for electronic editing. Through in-person and Skype interviews, you will learn firsthand from a variety of editors the professional requirements and skills needed to complete an array of editorial tasks and jobs. You will also learn standard copyediting marks and practice copyediting tasks. Additionally, you will practice following style sheets (and style guides) for class assignments and review grammar principles in order better to identify and fix errors in what you are editing (and in your own writing). Writing the Grant Proposal is a hybrid course that will meet once a week on campus; the second weekly meeting will take place online. ENG 680 will introduce students to the fundamentals of grant writing, a critical part of working in the nonprofit sector (as well as in academia, the arts, and research). Successful nonprofit grant writers raise the money to allow an organization’s programs and specific projects to move forward, to facilitate growth and the achievement of key objectives, and, in many cases, to quite literally keep the doors open. Functioning primarily as a workshop, the course will pair each student with a local nonprofit organization, for which the student will serve as a “consultant.” By the end of the course, each student will have written a full grant proposal for his or her organization. The course will primarily emphasize developing convincing and compelling language for each piece of the grant proposal, but students can also expect to learn about a typical grant-making process and about how to conduct research to generate a strong proposal and to find appropriate funders. This course fulfills Area III, Professional Writing. Questions? 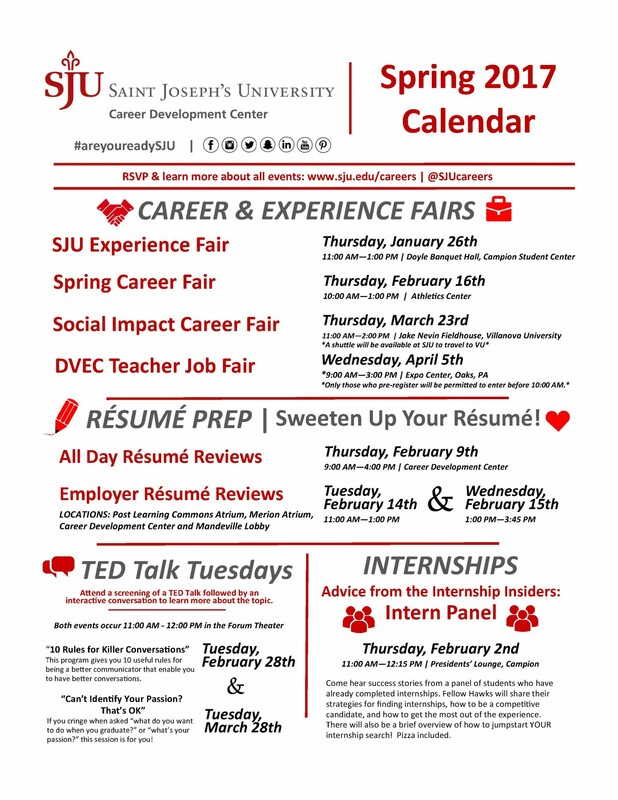 Email Director Tenaya Darlington at tdarling@sju.edu or Heather Foster at hfoster@sju.edu. 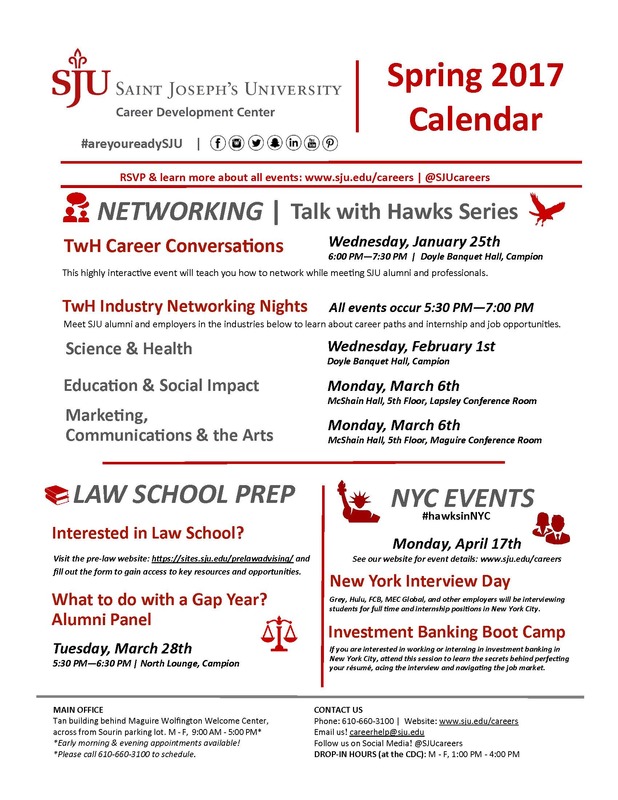 Take a look at the events the Career Center has planned for spring 2017.